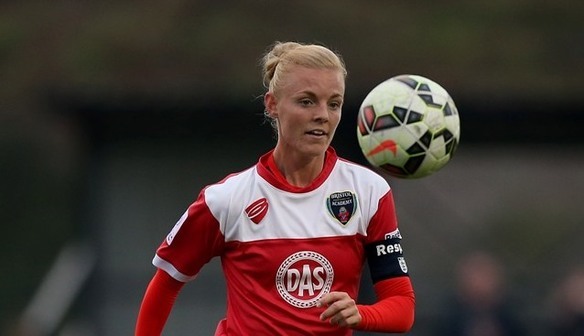 Bristol Academy captain Sophie Ingle hopes the Vixens can build on the performance shown in their end of season 4-2 victory against Liverpool next year in WSL 2. Willie Kirk's side finished bottom of WSL 1 with just eight points after a season of change at Stoke Gifford Stadium, with victory against the Reds just their second win of the campaign. But Ingle was pleased with the emphatic display and hopes to use it as progress to build on when they return to FA Women’s Super League with BT Sport action next year. Ingle said: "In previous games this season we've played well but overall we haven't been good enough. But today I thought we were very good for a lot of the match so it was a good game to end the season on. "We had a lot of change; with a new manager and a lot of new players it's hard to gel together in a short space of time. But now towards the end of the season we've started to click, which isn't ideal but hopefully it will help for next season. "If the team changes again we will have to start again like we did at the mid-season break so hopefully the players will stay and we can add a couple of new players, have a good pre-season and be ready for FA WSL 2 next year." The Vixens took the lead inside ten minutes when Caroline Weir prodded home Loren Dykes' cross, before a Hannah Short own goal levelled things up after 20 minutes. Bristol continued to attack, however, and took a 2-1 lead into the break thanks to Christie Murray's sublime lob over Danielle Gibbons. Kirk's side added a further two goals after the break with Weir doubling her tally for the night and Tatiana Pinto making it 4-1, before Natasha Dowie fired home a late consolation. Despite defeat, Martha Harris is hopeful of cup success in the coming weeks. Harris said: "Obviously we wanted to win our last WSL 1 game to kind of end the season on a high, but we've got to focus on the Continental Tyres Cup and credit to Bristol they played really well. "We've got the Conti Cup semi-final and then the Champions League coming up so hopefully we can get through them and get to the final. There is a lot still to play for before we start next season afresh. "I think we knew we needed to focus on the cups because we didn't have much chance of winning the league so to win a cup would be a good end to the season overall." Bristol Academy (4-3-3): Mary Earps; Loren Dykes, Hayley Ladd, Hannah Short, Frankie Brown; Tatiana Pinto, Georgia Evans, Sophie Ingle; Caroline Weir, Christie Murray, Angharad James. Substitutes: Nadia Lawrence for Pinto 84, Evdokia Popadinova for Christie 88, Emma Tustin for Evans 90+3. Substitutes not used: Hannah Reid, Sharla Passariello, Gabby Bird, Katie Jones. Liverpool (4-5-1): Danielle Gibbons; Martha Harris, Gemma Bonner, Satara Murray, Maz Pacheco; Ingrid Ryland, Lucy Staniforth, Katrin Omarsdottir, Rosie White, Katie Zelem; Natasha Dowie. Substitutes: Ashley Hodson for Maz Pacheco 45, Asisat Oshoala for Katrin Omarsdottir 62. Substitutes not used: Rachel Darbyshire, Mollie Green, Shannon Beckwith, Hannah Dale.